The 2019 season has seen a changing of the guard in the Ostersund squad. As of the 18th December 2019, after Oscar Friberg had completed his third season in charge of Ostersund, there are only six players in the first team squad who remain from before Friberg joined Ostersund. 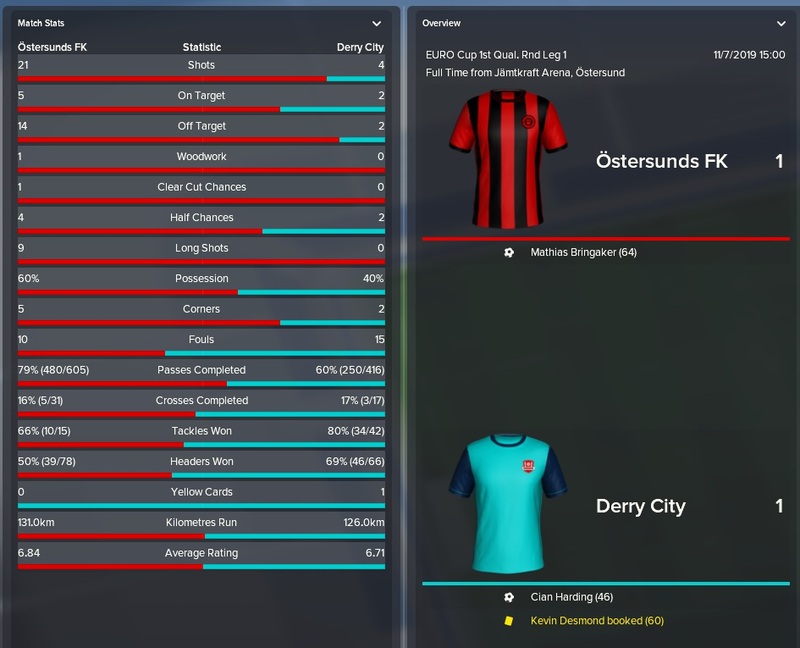 In this post I’ll be reviewing the 2019 Swedish season and looking at how Ostersund performed under Friberg. I will be referring to several Ostersund players in this post (shocker) so if you’d like to get up to speed do go back and read #2.2 in our series (Ostersund Squad Review). Some of the players’ departures were Friberg’s doing. Englishman Jamie Hopcutt joined Ostersund way back in 2012 and had developed into an important first team member over the years. But Friberg decided it was time for him to move on, his advancing years meant that he wouldn’t get much better and there were better options available in his position. There were no immediate plans to sell Hopcutt at the end of the 2018 season. Though we were certainly looking to upgrade him, the plan was to keep him as a backup. However, several Swedish clubs were interested in his services and we decided against turning down £500K from Goteborg. 18 year-old Angel Gomes was signed on loan for two seasons as a direct replacement for Hopcutt. Gomes will be playing in the inside forward role on the right side of our attacking trio, a role in which he is very adept to. His pace and vision are far superior to those of Hopcutt, and I expect his physicals to develop as he ages. If you focus purely on the average attribute value highlighted next to each group, Gomes has improved by 6 points compared to Hopcutt’s 0. And with an extra year with Gomes in my side, I expect him to continue to develop and perhaps be a true game-changer in the upcoming 2020 season. We also let go of striker Saman Ghoddos. This was a trickier decision as Ghoddos had played well for us in our first two seasons. But he was never prolific. 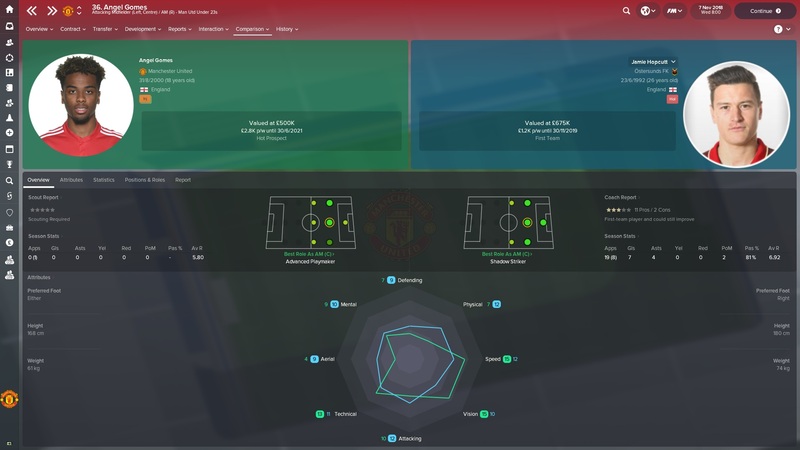 He scored 24 league goals across two seasons, as our lone-striker I need at least 20 per season. Atalanta came in with a £950K bid for Ghoddos in January and we chose to accept it. His direct replacement was Norwegian striker Steffen Lie Skalevik and we brought him in for just £60K. Skalevik offers us something more aerially compared to Ghoddos which, although not crucial when playing with inside-forwards, adds an extra string to his bow. The two departures mentioned above were ultimately the decision of manager Friberg. Ken Sema, on the other hand, was not. On the transfer deadline day at the end of the summer transfer window, Malmo came in with a £3.3M offer for Sema. The board went and accepted it. This gave us little to no time to organise a replacement. We brought in youngster Jason Eyenga-Lokilo on loan from Crystal Palace. The two players appear similar in terms of his attributes, but Ken Sema’s experience will be sorely missed. His Swedish nationality was a huge help with the squad registration rules but it is his quality on the pitch that will be missed the most. 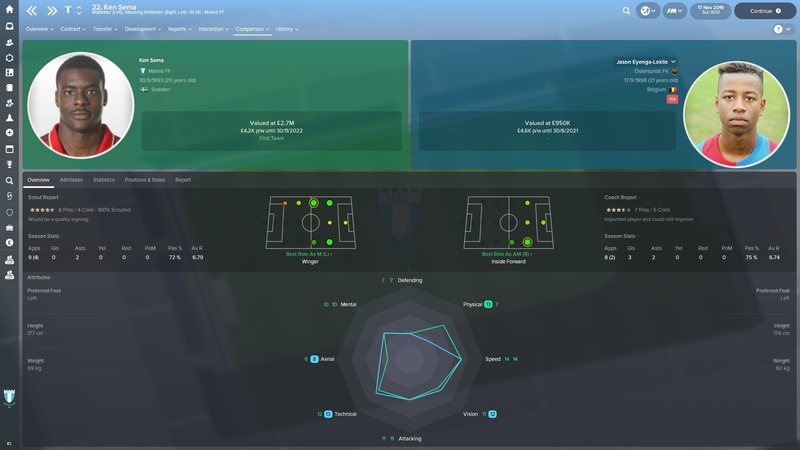 Three big players have departed the club and Oscar Friberg is clearly building for the future. So how did his team get on in the 2019 season? 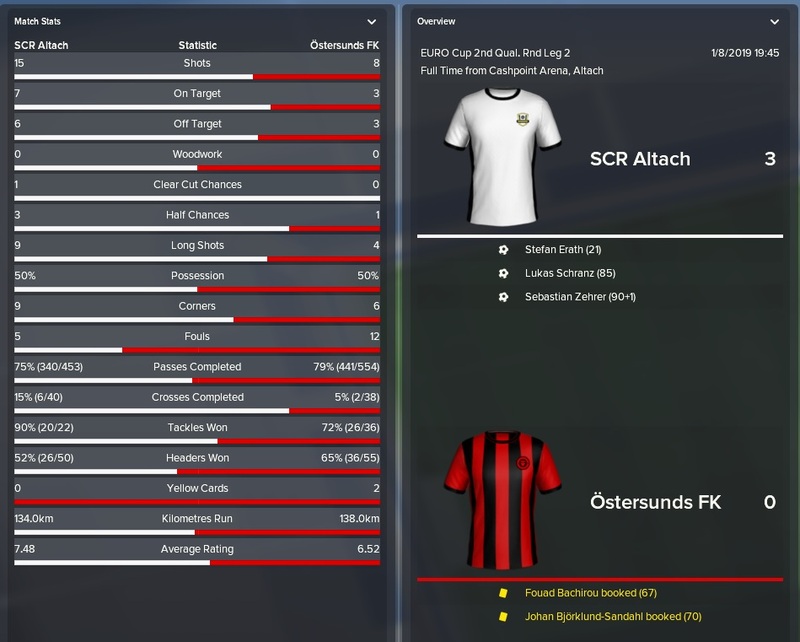 In the competition that is spread over two seasons, Ostersund reached the Semi-Finals of this years Swedish Cup. We were knocked out by Norrkoping, losing 2-1. With the way this competition is formatted (the group stages are seeded) a cup final appearance should only be two tough matches away. This is a competition I absolutely want to win sooner rather than later. Finishing second in the 2018 Swedish Allsvenskan qualified us for the 1st Qualifying Round in the 19-20 Europa League. 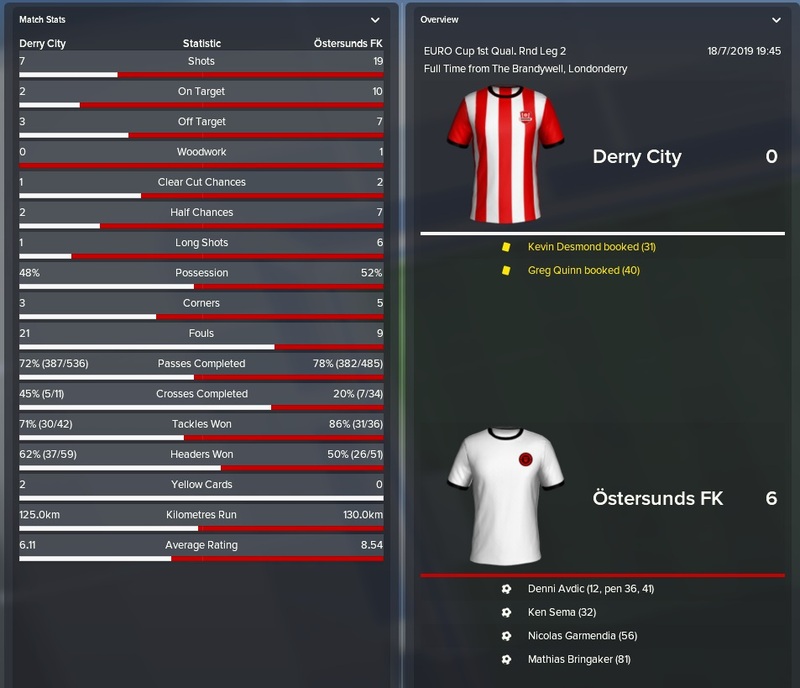 We were drawn against Irish side Derry City. An amazing away performance saw us progress to the second round. We were disappointing in the first leg at home but 6 goals in Ireland was just about enough to see us through. Austrian side Rheindorf Altach were up next and again we were to play the first leg at home. We deserved to be knocked out. Our lack of quality in attack in the first leg, scoring just 1 of 23 shots, meant that we travelled to Austria defending a small lead. Nonetheless, the performance in Austria was abysmal. A shocking 3-0 loss saw us eliminated from the 2019-20 Europa League. 4th place instantly seems like a failure when you consider we finished 2nd last year. 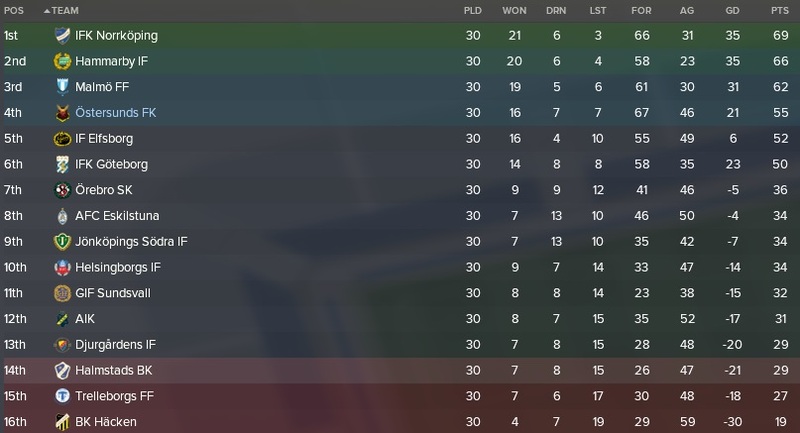 But by finishing 4th we have qualified for the Europe League starting in June 2020, this is crucial to our continued progression as a club. Let’s compare our 2018 season with our latest 2019 season (league games only). As you can see, there wasn’t too much difference between the two seasons. What is surprising is the large increase the number of goals scored and conceded, despite playing the same tactic. The plan for the 2019 season is to strengthen our defensive players and hopefully cut out some of the mistakes that lead to our goals conceded. 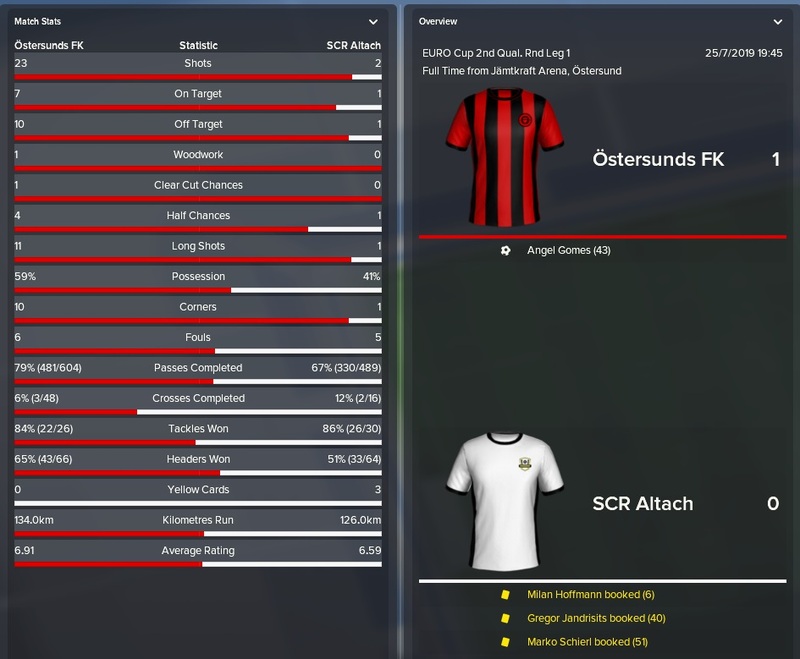 I’m enjoying my save with Ostersund so far. It’s certainly been a fun adventure and I’m hoping it will continue for a long while to come. Thank you very much for reading another instalment of our Football Manager 2018 story here on VivaLaVidaFM. If you enjoyed it, do leave a like or a comment, let me know what you think of our save so far.